Picked up some more models. Looks like I'm going with the Combined Army faction, at least to start with. Not bothering with Sectorials at this stage. Current list of owned models: Raicho (HMG+Heavy Flamer, no pilot yet) Charonid (Plasma Carbine) Malignos (Combi-Rifle) Med-Tech Obsidon Mechanoid Slave Drone (2) Reasoning of purchases: Charonid (new version) is an excelent looking model. He's also got a Lietenant + Hacker option, which seems good for a starter player. Also has the G: Mnemonica, which makes my lietenant much more survivable, which seems like a good thing for a new player. Malignos has access to mines. I fundementally like land mines, at least in games (not sure if it extends to real life). He also has a Cube and can be Forward Observer, Hacker or Lietenant. Raicho, I need to convert so he has mines. The old version has the mines, but the new model looks better, so I'll need to convert. Drops Heavy Flamer for Heavy Shotgun and Mine Dispenser (mine lobber, I love it). Raicho is also the only Combined TAG with a cube. Med-Tech is both a Doctor and Engineer, and is a fieldable part of every Sectorial army (unlike the other models). He also has D-charges. So lots of mission value. Also has a cube. Slave Drones come with the Med-Tech. Also the cheapest model in the army (3pts each). Good filler, also has mission value because they are G: Autotool. Model purchases also has to do with availibility at GG. Probably order some others online, but wanted to support locally too. Hiya! I am looking to see if anyone has a Kuge Delegate from the new JSA army box that they are willing to sell or trade. While playing @Andrewc yesterday, he pointed out that models with sensor have a +6 bonus on all discovery rolls, elven rolls outside the sensor zone. So Aleph’s Daleth FO remote will be discovery a camo model in a bad range band on a 13, in a flat band on a 16, and in good band on a 19 The 16 point FO bot becomes an even better tool. Congrats to @thediceabide and @George for Honorable Mentions in the MayaCast Conversion Contest and Obidiah Hampton for winning the event. Introduction: I’ve been meaning to start a blog on this forum for a while, but always run out of motivation before I even make the initial post. Fresh off the heels of OFCC, I am motivated and have some free time, so I figured I’d give it a go and see what happens. For those of you who don’t know me, I played Warhammer Fantasy for many years, before personal life conspired with GW to put an end to that hobby. Wisetiger and Muskrat brought me back to the scene with Infinity in December, and I’m pretty much hooked. What do I hope to get out of this blog? 1. I hope that having some semi-public pressure from peers will motivate me to continue to improve, make progress on armies and terrain, and try new things (and also playing games I guess). I will want to have something to share, and that means putting paint to metal and models to the table. So thank you in advance for keeping up the pressure. 2. I had a fantastic time at this year’s OFCC and felt a sense of community that was lacking in the past. I want to continue to participate in this community year-round, and not just at events. This blog will a good way of doing just that. 3. I want to get input and insight into lists, painting and rules, and share my own thoughts, techniques etc. Participation is a two-way street. As much as I want to learn, I also want to teach and share, to the best of my limited abilities. If anyone has a question, let me know. To kick this blog off, I want to start with a priorities list. These are items that I want to get done in the next month, in no order: · Must Finish Painting- o 1x Imetron o 1x Ikadron o 2 X Slave Drones o 1x Unidron Plasma Sniper Rifle These are the backbone of any onyx army and will be used in almost every 300 point game. These are all base-coated and need details and basing. · Want to finish o Overdron Batroid o Umbra Legate Hacker o M-Drone Again, all of these are base-coated, but these are not as high a priority, but they are fun models I want to finish soon. Once these have been completed, I will finally have a fully painted 300 point list: Overdron 300 ────────────────────────────────────────────────── GROUP 110 OVERDRON Hyper-Rapid Magnetic Cannon / . (2 | 74) STALDRON Flash Pulse / Knife. (0 | 0) NEXUS (Specialist Operative) Combi Rifle / Pistol, Knife. (0 | 16) UNIDRON Plasma Sniper Rifle / Pistol, Electric Pulse. (1.5 | 24) UNIDRON Missile Launcher, Light Shotgun / Pistol, Electric Pulse. (1.5 | 20) UNIDRON (Forward Observer) Plasma Carbine / Pistol, Electric Pulse. (0 | 15) UNIDRON (Forward Observer) Plasma Carbine / Pistol, Electric Pulse. (0 | 15) NEXUS Lieutenant Hacker (EI Hacking Device) Combi Rifle, Nullifier / Pistol, Knife. (0.5 | 24) UMBRA LEGATE Hacker (Hacking Device Plus) Boarding Shotgun, Flash Pulse / Pistol, DA CCW. (0.5 | 43) MED-TECH OBSIDON MEDCHANOID Combi Rifle, D-Charges / Pistol, Knife. (0 | 23) SLAVE DRONE Electric Pulse. (0 | 3) ÍMETRON . (0 | 4) GROUP 24 M-DRONE Combi Rifle, Sniffer / Electric Pulse. (0 | 17) IKADRON (Baggage, Repeater) 2 Light Flamethrowers, Flash Pulse / Pistol, Electric Pulse. (0 | 9) IKADRON (Baggage, Repeater) 2 Light Flamethrowers, Flash Pulse / Pistol, Electric Pulse. (0 | 9) ÍMETRON . (0 | 4) 6 SWC | 300 Points Open in Infinity Army Thanks for reading. I have a copy to Infinity Uprising that I bought just for the exclusive merc model. I am selling the book alone (without the model) for $30 for anyone interested. It is still new in shrink wrap. Happy to ship or deliver it in person to the greater Portland/SW Washington area. Ladies and Gentlemen, 300 Points. It is time to play Frontline! I hope to see you all there. Time: 3 PM to 7 PM (we sometimes close later) Location: 717 SE Main St. Portland OR 97214 (map) - Around the corner from Kokiyo Teriyaki and up the stairs Cost: $5 for Ordo Members, $2 for Ordo Warlord Champions, FREE for Emperors! And as always, your first Game Night is FREE! Games we play: Infinity! All are welcome. We also have tables open for Blood Bowl, Necromunda, AoS, 40k, or whatever game you want to play. Although it is possible to find a pickup game at Game Night, it is much better to prearrange a game before coming down. Hope to see you there. I am looking for a CSU model for Infinity. Ideally the one that comes from the Expanded Red Veil box. The older one is a bit pricey for my pocketbook typically though I am open to discussion! I have paypal cash monies as well as 40k Tau, Warmachine Khador, and AoS Seraphon stuff with which to trade. Time: 3 PM to ???? (we sometimes close later) Location: 717 SE Main St. Portland OR 97214 (map) - Around the corner from Kokiyo Teriyaki and up the stairs Cost: $5 for Ordo Members, $2 for Ordo Warlord Champions, FREE for Emperors! And as always, your first Game Night is FREE! Games we play: 40k, Blood Bowl, Board Games and more All are welcome. 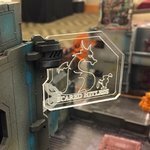 We also have tables open for Blood Bowl, Necromunda, AoS, 40k, or whatever game you want to play. Although it is possible to find a pickup game at Game Night, it is much better to prearrange a game before coming down. Hope to see you there. Sunday, January 7th! We Play! Hey All, It is the New Year! Let’s play. 3 PM 300 Points Acquisition See you there! Happy Holidays from Scared Hitless! No plans on New Years Eve? Away from family and loved ones? Want to show off your new toys from Christmas? Can't make it to Ordo game night? Then come on down to Newberg to play with the Scared Hitless crew in Andy's garage! We will have space for about 4 more players, and want to hang out with YOU! We'll order some pizza, and try and heat the garage with body warmth. This is not a tournament, just a time for some friendly games, responsible day drinking and practice for the January Adversary ITS in Sherwood (https://www.infinitythepdx.com/news/2017/12/2/january-adversary-its) When: Sunday 12/31, Between 12pm and 8pm. Newberg, OR (PM me for details) Who: Andy Caitlin Aaron Frazier And possibly YOU! PS. Bring a coat. Let's Rampage! Yup, it that time again. I have been holding them for 11 years now. I have run over 15. This year will be an Infinity Event. Yes, there are will still be a Sword as the overall prize. What is a Rampage? A Rampage is a celebration of gaming goodness where community and sportsmanship is valued as much as winning. Traditionally, it is the celebration at the end of an Escalation League. Players gather, bring food and drinks, and play games. Somebody wins a sword and we all go out to for beer afterwards. Each year, I select a charity to support. This year, I picked the Women's Shelter. It a homeless shelter downtown off Burnside and Second. I am asking players to bring food stuffs, cash donations, or hygiene products. When Is this Event? It is on Saturday, December 2nd. First Round is starts at 10 AM. Where? WoW, 717 SE Main Street, Portland, Oregon How Many Games? There will be four! We will be playing until 7 PM, and then go get dinner and beer afterwards. Points? 200. $10 for Everybody Else Prizes? A Sword for the Winner! - Yup a Freakin' Sword! And there will be other prizes. Wait and See! Best General. Best Sportsman. Best Painted. Wooden Spoon! Number of Slots? 24 Players Scenarios: TBA Scoring: Battle Scores: 40 points max A major win is worth 5 points (a win by 5 points or more), a minor win is worth 3 points, and a tie is worth two points. There will be a check list worth an additional 20 points and will be totaled after all four games. Charity: +10 points for bringing dry or canned food or clean bedding (sheets, blankets, pillows, sleeping bags, etc.) Food: +10 Points for Bringing Food to share. +10 Points for Bringing Drinks to Share +5 For bring the best snack! *Determined by players’ vote. Painting :+10 Points for playing a completely painted and based army. +10 Points for having the best painted army. +5 Points for having the best painted silhouette two model . Welcome to the future. It is shiny and filled with remotes and TAGs. Assemble your forces to the Fall Infinity Escalation League. We would love to have you, even if it for only a week or two ! Where: WOW. 717 SE Main Street. Portland, OR Who: You and your friends. Friendly faces are always welcome. Purpose: To learn the game of Infinity and play in a fun environment! Cost? Standard Game Night Dues Apply! First time visitors are always free. Starting Date: Sunday, September 24th. - The week after Infinity Boot Camp! Ending Date: Sunday, November 26th. - The following weekend will be the Rampage, December 2nd! League Points will be Award for the following: Attending: 1 Point. Yes just hanging out with is is cool! Playing: 1 Point per game each game night. Winning a Game: One Point (maximum of 2 Points per week). Each Model flashed, assembled, and based each week before Game Night. 1 Point. (Maximum of 10 for the duration of the league.) Purchased a Model from a local game store and bring the receipt in to WOW. 1 Point (Maximum of 1 Point) Each model completely painted, table top standard, including base. 1 Point (Maximum of 10 points) Bringing food or drinks to share with the group. 3 Points. Bringing a new player. 3 Points. Telling a good joke. 1 Points. Recalling or tales of building, modeling, playing, etc, in the Infinity Forum thread. 1 Point per week Having an cool turn of bad or good luck (Determined by me or the group). 1 Point And anything else of excellence. 1 Point Winner: Receives a free pass to the 2017 Rampage. Are you in? Date: Sunday, November 5th, 2017 Time: 3 PM to 8 PM (we sometimes close later) Location: 717 SE Main St. Portland OR 97214 (map) - Around the corner from Kokiyo Teriyaki and up the stairs Cost: $5 for Ordo Members, $2 for Ordo Warlord Champions, FREE for Emperors! And as always, your first Game Night is FREE! Games we play: Sunday night is primarily Infinity night. Anyone interested in checking Infinity out is always welcome. We also have tables open for Blood Bowl, AoS, 40k, or whatever game you want to play. Although it is possible to find a pickup game at Game Night, it is much better to prearrange a game before coming down. Hope to see you there! 16 people played for Week 5. Thank you all! Week Six of the Escalation League is October 29th! Time: 3PM! Points: 250! Bring Food, Bring Friends! Play two games! Let me know, if you want a teaching game! Can You Hack It? Ladies and Gentlemen, Let's hack! This week is all about hacking! How to Score: Take a Hacker: 2 Points Every successful unique hacking program is worth a point. Kill an enemy hacker: 1 point Kill an enemy hacker with your hacker: 1 point. Special Rule: Anybody can take a single Mercenary Hacker without the SWC penalty. Double points for painting a Hacker! BLACKOUT (INFOWAR) SHORT SKILL / ARO Attack, CLAW-1. REQUIREMENTS The target must carry a piece of Equipment with the Comms Equipment Trait (Hacking Device, Repeater, Sniffer...). The target of this Hacking Program need not have the Hackable Characteristic. EFFECTS Allows the user to make a WIP Roll against the target. A successful Roll forces the target to make a BTS Roll versus Damage 15. Failing the BTS Roll causes the target to enter the Disabled state, signified by a Disabled Marker (DISABLED) in base to base contact. The effects of this program persist until the opponent cancels the induced state by whatever means. The range of this program is the Hacker's Hacking Area. Thank you for a fun Game Night. Thank you Jenni, Pete, , Scott, Josh, Edward, Darron, Joel, Berman, Jay, Aaron, and Brandon for attending. Still want to play? There is still plenty of time and space for you! Week Five of the Escalation League is October 22nd! Time: 3PM! Points: 225! Bring Food, Bring Friends! Play two games! Let me know, if you want a teaching game! Mission: 3,2,1....... Ladies and Gentlemen, We are having a movement mission. Hussle your models models across the field and score! Every model that is 12"-24 inches from your edge is worth one point. Every model that is 24"-36" inches from your deployment zone is worth 2 points. Every model that is the opposing zone at the end of the game is worth 3 points. Your Data Tracker adds a point for being in a scoring zone. Infiltration, AD, and Mechanized Deployment units are encouraged! Special Rule: +1 For going out afterwards and hanging out. Hello, Thank you for a fun Week 3. I hope we can have have Edward, Josh, Jenni, Pete and Evan back for Week 4. Still want to play? There is still plenty of time and space for you! Week Three of the Escalation League is October15th! Time: 3PM! Points: 200! That is the same amount as Week 3. Some people need time to build up there army. Bring Food, Bring Friends! Let me know, if you want a teaching game! Mission: Decapitation MISSION OBJECTIVES MAIN OBJECTIVES To kill more Army Points than the adversary (2 Objective Points). To kill the same amount of Lieutenants as the adversary (2 Objective Points, but only if at least 1 Lieutenant is killed by the player). To kill more Lieutenants than the adversary (3 Objective Points). To kill the Designated Target (2 Objective Points). To kill the Designated Target with your DataTracker (3 extra Objective Points). CLASSIFIED There are no Classified Objectives. DEPLOYMENT Both players deploy on opposite sides of the game table, in a Deployment Zone 16 inches deep. SCENARIO SPECIAL RULES REINFORCED TACTICAL LINK In this scenario the rule Loss of Lieutenant does not apply. In this mission, the identity of the Lieutenant is always Public Information. The player must indicate which Marker is the Lieutenant if it is in a Marker state (Camouflaged, TO Camouflaged...) or which Markers are the Lieutenant in the case of a Holoprojector. The Lieutenant must be placed on the game table at the beginning of the first Game Round, either as a model or as a Marker. Players may not deploy their Lieutenants in the Hidden Deployment state. If the player lacks a Lieutenant during the Tactical Phase of their Active Turn because this trooper was not deployed or because it is in an Isolated or a Null state (Unconscious, Dead, Sepsitorized…), then the player must name a new Lieutenant, without Order expenditure. The identity of this new Lieutenant is also Public Information. It is compulsory such Lieutenant be a model or a Marker placed on the game table. DATATRACKER At the end of the Deployment Phase, players must declare which troop from their Army List is the DataTracker. The trooper chosen must be always one of the models deployed on the game table. Players are not allowed to choose troopers in Hidden Deployment or in Marker state. This trooper must always be on the game table as a model and not as a Marker (Camouflaged, TO, Holoecho…). Also, Irregular troops and those whose Troop Type is REM are not eligible to be DataTrackers. The DataTracker is identified with a DataPack Marker (DATA PACK). DESIGNATED TARGET In this scenario, the enemy HVT is considered an enemy trooper instead of a Neutral Civilian so, it can be targeted by Attacks. Killing the enemy HVT does not cause loss of the game nor gives compensatory Objective Points to the adversary. HVTs will be reactive and hostile, reacting to any Order performed by an enemy active trooper in LoF or ZC. KILLING A trooper is considered Killed when he enters Dead state, or is in a Null state at the end of the game. Troopers that have not been deployed on the game table at the end of the game will be considered to be Killed by the adversary. NO QUARTER In this scenario, Retreat! rules are not applied. CLASSIFIED DECK NOT USED Players will not use the Classified Deck in this scenario. END OF THE MISSION This scenario has a limited time frame, so it will automatically finish at the end of the third Game Round. JUMP ENTIRE ORDER Movement, No LoF, No Roll. REQUIREMENTS EFFECTS Allows the user to move horizontally (to clear a gap), vertically (to reach a higher or lower surface), diagonally or tracing a parabola, up to his first MOV Attribute value in inches. Jump is a Common Skill that does not require a Roll. When Jumping, measure the horizontal, vertical, diagonal or parabolic distance between the starting location and the landing spot. If the first MOV value is insufficient to reach a landing spot for the Jumping model, then assume it falls vertically from the end of its available Movement to the ground. Measure this fall distance for Fall Damage purposes. Troopers cannot benefit from Partial Cover MODs during an Order in which they declared Jump. Jumping movement must follow the General Movement rules as well as the Moving and measuring sidebar, both of which are explained in the Move Common Skill rules. When Jumping, the landing point cannot be narrower than the base of the trooper. REMEMBER Troopers can vault over obstacles smaller than their Silhouette Template at no cost. Anything higher than that requires a Jump declaration. Hello infinity Players! Thank you for a solid Week Two. I hope we can have a full house for Week 3. If you missed Week Two , there is still plenty of time and space for you! Week Three of the Escalation League is October 8th! Time: 3PM! Points: 200! That is 25 more points. Bring Food, Bring Friends! - Please Bring Water! We are out. Let me know, if you want a teaching game! Mission: Doctor, Doctor. 7 Injured civilians are on the table. They will be placed in the zone that is 8 inches from each side of the center line. The civilians are prone and will be placed by me. The goal is to Forward Observe and heal as many of the civilians as possible. You may not target the civilians for any attacks. Scoring: 4 Points for healing more civilians than your opponent. 3 Points for FOing more civilians than your opponent. 2 Points for killing more opposing doctors / paramedics than your opponent. 1 Point for killing more opposing forward observers than your opponent. Special Mission Rule: Any civilian that has been forward observed, may re-roll its PH roll for any doctoring or for use of the medikit, if the forward observing is on the same side. Special Rules: 1. If the player has one command group, Command Tokens cannot be used for strategic purposes. Let me know if you can make it.